When Rodolfo Costa was found naked on the floor of his home in Paraguay, he had been dead for days. Though ostensibly jobless, he had mysteriously amassed a small fortune. He also had a secret alias-Hector Torres-and a secret life. At the time, Renate Costa Perdomo was a young girl. Asked to select her uncle's burial garb, she found his closet empty. Surely the lively, colorfully-dressed Rodolfo she knew could not, as those around her claimed, have died of sadness. In her powerful debut feature, which unfolds like a mystery novel, Costa Perdomo investigates the shadowy circumstances of Rodolfo's death. Witnesses and clues gently reveal Rodolfo's true identity as a persecuted gay man and the terrifying "108" homosexual blacklists that ruined lives, careers, and families. The film is also a fascinating portrait of the relationship between the filmmaker, who has left Paraguay and now lives in Spain, and her now-divorced father, Pedro Costa, who remains in the family blacksmithing shop. 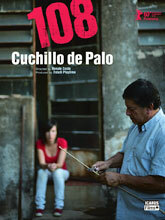 108 is a moving illustration of the impact that the right-wing dictatorship of Alfredo Stroessner, who ruled Paraguay from 1954 to 1989, had on the so-called "108"s living in the country as experienced by a single Paraguayan gay man and his family.